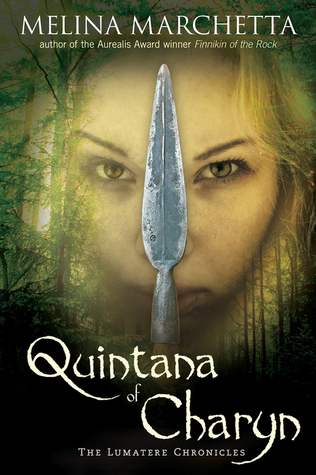 Today’s Bookanista recommendation is Quintana of Charyn, the final novel in Melina Marchetta‘s incredible Lumatere Chronicles. From Goodreads – Separated from the girl he loves and has sworn to protect, Froi and his companions travel through Charyn searching for Quintana and building an army that will secure her unborn child’s right to rule. While in the valley between two kingdoms, Quintana of Charyn and Isaboe of Lumatere come face-to-face in a showdown that will result in heartbreak for one and power for the other. The complex tangle of bloodlines, politics, and love introduced in Finnikin of the Rock and Froi of the Exiles coalesce into an engrossing climax in this final volume. Since reading Finnikin, I zipped through Froi of the Exiles, which was wonderful but, as is often the case “middle” books, was my least favorite of the trilogy. When I finished Froi, I dove straight into Quintana of Charyn and read obsessively from beginning to end. In hindsight, I’m glad I waited until all three Lumatere Chronicles books were released before beginning to read them. This trilogy is complex; its cast of characters is extensive, and its plots are numerous and overlapping — I’m forgetful and I imagine I would’ve ended up confused if I’d had to endure a year between books. It was a treat to be immersed in this world and the lives of these characters for a few weeks, with no interruption or waiting. Quintana of Charyn is a stunning conclusion to an amazing trilogy. Despite its considerable length and complicated storyline, it is a fast read. I had a hard time putting it down, and even when I did, I was still thinking about Quintana, Froi, Finnikin, Isaboe, Lucian, Phaedra, and the many other vibrant characters who populated this book and its predecessors. Aside from the characters, Quintana‘s plot (and the way it builds upon the plots of the previous books) is its greatest strength. There are many POVs and lots of crazy things going down, but the novel never read as convoluted or confusing. I attribute that to the tight and precise weaving of the story’s threads. I LOVE when random details sprinkled throughout a book reappear hundreds of pages later and become major elements in the story’s plot. Melina Marchetta is a masterful plotter (hello, Jellicoe Road), and the careful way she planned and executed the Lumatere Chronicles gave me chills many times over. Bits of information that seemed inconsequential in the first two books came together in the most satisfying way by the time Quintana of Charyn wrapped up. And, while we’re speaking of conclusions, I must say that Quintana did not disappoint. In fact, I’ll go so far as to declare it one of the most gratifying finales I’ve read. I love this trilogy so very much, for its dynamic characters, sophisticated themes, and beautiful prose. I’ll recommend it up and down the blogosphere, but I think fans of high fantasy will especially appreciate it. Even if you’re not a big fantasy reader (I am not), please do give Quintana of Charyn and the Lumatere Chronicles a read. I think you’ll be glad you did. Lola Sharp’s review, which speaks eloquently to Quintana‘s mature themes. Kat Kennedy’s glowing review — she’s a Marchetta fangirl like me! I can’t wait to read this one! After reading your review, it sounds like this is definitely one where I need to re-read the first two before diving in (fine by me, since I loved those books anyway.). I think that’s how I’ll spend my summer–catching up on sequels that I’ve been putting off because I need to re-read. A series with strong characters, complex relationships and complicated plot? Sold. Margo, it is all those things and more. I loved it! I hope you love it as much as I do, Elodie!